Do you ever observe how your LFS stocks their tanks? | Saltwaterfish.com Forums for Fish Lovers! Do you ever observe how your LFS stocks their tanks? Oh and I got the pic from their facebook page. Holding it to take pics. Pet stores...critters are in easy to get to holding tanks to sell the fish, puppies and kittens are in small cages. As long as the holding tank..cage or whatever is clean and the critter fed, it's considered a good pet store. I watched a worker just dump a bunch of new fish into a big tub without acclimation....I was mortified, and I think I now know why new fish are so stressed. ...but the picture on your post just doesn't seem so bad to me, it looks to me like the person is using both hands while gently cradling the fish, and it's being releasing into the tub or whatever it is. You didn't post a caption or what the picture is actually trying to show. The person that is holding the fish is destroying the slime coat. The LFS that I posted the pics of does this with ALL of their FW and SW shipments. There is absolutely NO reason to be handling a fish like this for a photo op. Meowzer needed to handle the fish to give it medicine. It was necessary and her pic was informational. Eh, at least the guy isn't handling it like a mouse trying to get away. He is being careful... And part of the fish is also underwater. I don't see a whole huge big fuss with the matter, to be honest. How is using your hands worse than catching them in a net? You would be appalled at some areas of the world - where they regularly fish the reefs for tangs so that they can have something to EAT. Asian cultures eat baby puppies, cats, boiled fully grown ducks in their eggs... In South America, they eat guinea pigs. It's because we are in America ... in our culture... sometimes it's not ok to treat things a certain way. All I can say is... keep in mind - it's just a fish. A pretty fish - but just a fish. I like to keep fish alive, I like to see their colors, I love their personalities,... but in the end, it's just a fish - not my grandmother or my Preacher. Why can't they just take the pic in the tank? I recommend catching a fish in a specimen cup not a net. In the pic, the gills are not under water. I completely understand that people eat what we would consider to be pets. That is their desire and not a big deal. However, I believe the LFS needs to do what is right for the fish in their care. I think it is horrible that they will hold the pics just to take a pic. Other people will think it is OK. It also destroys the slime coat and leaving the fish more prone to diseases. The fish have already gone through the process of being collected, shipped to the wholesaler and then shipped to the LFS. 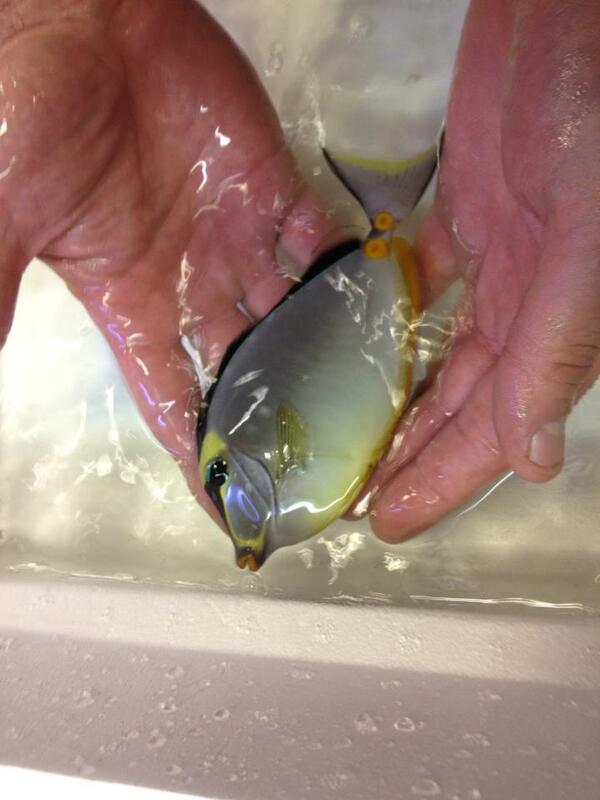 The fish will then be put in a system with who knows what and be prone to diseases. Why put the fish through any unnecessary stress? I understand what you are saying. I'm curious as to why the person is holding the fish. Somebody took a picture, true enough. Was the holder looking for disease on the fish before releasing it? Was the holder saving the fish after it did a jump? Did the fish just arrive and was being checked for injury? It could be all kinds of good reasons why a pet store owner would hold a fish like that. I doubt it was for advertizing, because a fish just looks better in the water, out of water the fins are tight against he body, when a fish certainly wouldn't look it's best. What did the facebook caption say? It was just done to post to FB. They do it with every shipment. I have seen them do it and asked why. They told me it was just to post the pics online and show people what just arrived. They say their customers want to know that the fish just got there. Oh I see...Then I have to agree with you, it's not very smart of the owners to super stress a fish they want to sell. I would tell him so, and I would not shop there. Tell me who they are and I will back you up, maybe if enough possible customers tell him the pictures like that convinced us to not go to his store.... he might change his methods. When I purchase fish, I try and get the ones that have been in the tank a while, corals too. They are acclimated and not so stressed, their chances of survival are much better and usually disease free. It's hard to think about but the entire process as was mentioned is one, big, stressful event for livestock when being taken from their environment and then introduced into our homes where they often become considered as pets. It's a sad part of the process but if people are paying good money for fish then they want to that what they're buying is worth it. That looks like a really nice fish but this probably happens quite a bit. And really, it's us the hobbyists that are doing this too these creatures. We create the supply, and dealers like this just shuffle the livestock. There's probably a passion for what they do, but it's more about the numbers for some folks. Seems like a pretty tough business to be in. And there's always a lot of unnecessary loss that occurs in order to fill the demand of providing us with these goods for a whole host of reasons. I don't see this as damaging to the fish. In fact, I transfer almost ALL my fish with my hand if I can. Using (CLEAN and SOAP-FREE!) wet hands is less damaging to the slime coat than a net, and you don't run the risk of gill spikes or tail barbs getting caught and twisted in the net. For whatever reason, most fish act calmer when I transfer them with my hands vs. a net. The other option would be to use a scoop. Great for fish with poisonous spines. My LFS sells a pretty good small plastic clear scoop for fish transfers, where you can keep as much or as little water as you want in with the fish. I have also used a clear gallon size bottle with the wide end cut off to good effect. My personal beef with local fish stores is their tank upkeep. When I walk into a store, the first thing I do is walk the sales tanks and look for dead fish. Let's face it. It's the nature of the business to have casualties, and I wouldn't expect every fish to make it through transit. But the store staff should walk the tanks a couple times a day and fish any bodies out. It's bad for the rest of the fish, and it's just bad for business....what message are they sending if there are a half-dozen bloated bodies drifting in the current?? If they don't have time to police the tanks, how are they with other maintenance jobs? A single dead animal, maybe two, I might live with. If I see more than that, I just walk right out the door. There is a bog box SWF store here that is a big offender of this.